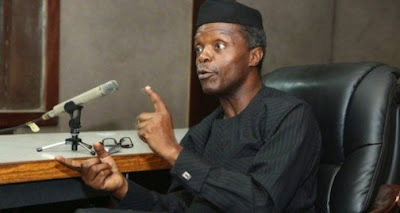 The Acting President, Yemi Osibanjo (SAN) has publicly denounced what he termed “crawling” judicial process in Nigeria. According to him, there was need for the judiciary to implement measures that would speed up justice delivery in Nigeria. Osibanjo stated this at the opening ceremony of 3rd Annual Judges Workshop on Petroleum, Gas and Power Sectors, taking place at the National Judicial Institute, NJI, in Abuja. The Acting President, who was represented at the event by the Minister of State, Petroleum Resources, Ibe Kachikwu, described the present slow judicial process in the country as a nightmare for investors. He said there was need for clarity in decisions of different courts, especially on commercial disputes, a system he said would engender credibility and reduce forum shopping by litigants. He said: “We need to evolve measures that will speed up the judicial decisions. We also need these decisions not to be too complicated for investors to easily understand. While emphasising that petroleum and the power sectors provide 80 per cent of Nigeria’s revenue and over 80 percent of foreign direct investment, Osinbajo, expressed worries that as critical as the sectors are, “if the country is not positioned to supply the necessary power supply essential for driving the economy, the country will not make much progress”.